One sleeve on and one sleeve off, together just enough to try it on for the first fitting. It is that moment when a project reaches a certain point and you can feel the excitement, nearing completion, at the peak of its perfection. It fulfills all your expectations and exceeds them, all in your minds eye. "This is going to be great, the best I've done yet. I'm really on to something here" your inner dialogue proclaims. Now from previous experience you know it's only down hill from here, things are not all they seem and disappointment will enter your mind. So quick question, do you ever just pause? At the peak of perfection, I will call it. Just soak up that good vibe, the endorphins that come at this stage; go have a snack and do a little dance to delay the inevitable? As an artist or designer you are on this roller coaster ride of emotion and confidence as you work. Moments of confusion and doubt when you encounter a hurdle that you hadn't yet considered in your careful consideration of how your work should progress. Moments when you are so manically working forward, beaming with anticipation that you forgot to add that smallest of detail that was going to make your work even better. Then you have decide if that detail will add that much more to make it worth undoing all that is done, to back track and spend extra time adding it in. I forgot to add the bust dart. 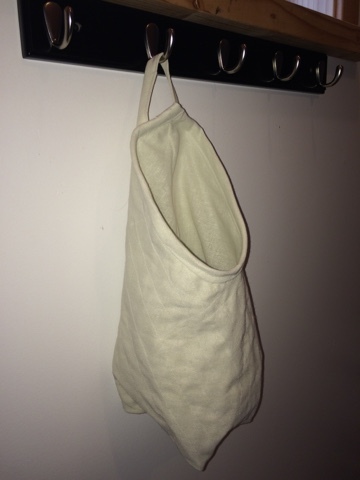 But once the first sleeve was sewn on, there was no going back. This was also the moment when I did a little dance in my kitchen, feeling so confident about the direction and outcome of this T-shirt. 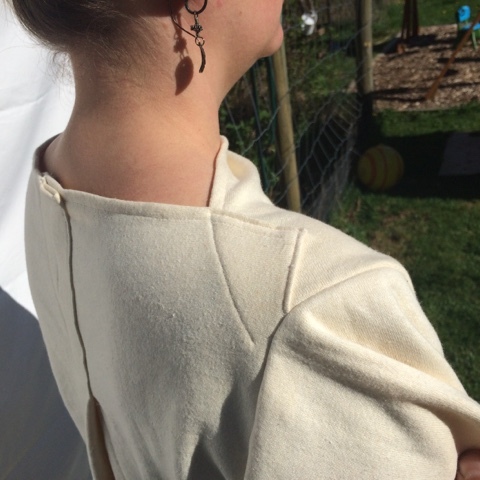 I can't proclaim to have discovered anything new, but maybe because I chose to drape a piece of hemp and cotton French terry jersey (26" x 57") on my dress form, I was able to appreciate this combination of techniques. 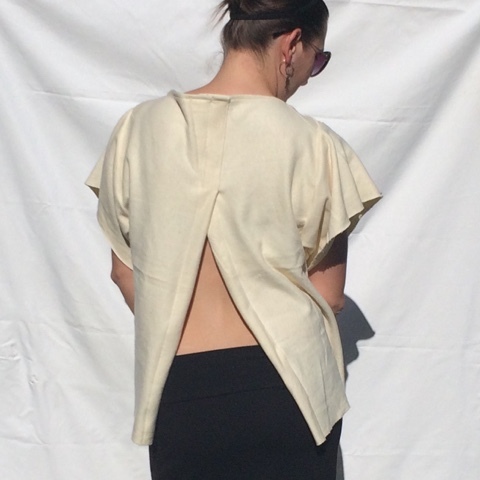 Zero-waste design, draping, simple cuts, and top stitching seem to be the design discovery I have been hoping to have! 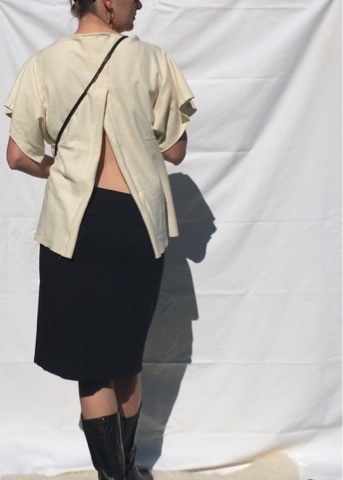 Flash back to Week 19 when I first used these techniques to create a top. I felt a little like I was cheating, because I wasn't able to forgive myself for not using traditional construction methods. Now, at Week 50, I can finally say "Ah Ha!! ", "this might be something!". A glimpse of what to look ahead to! Let's pause, and do a little dance together!! I love you my darling K!